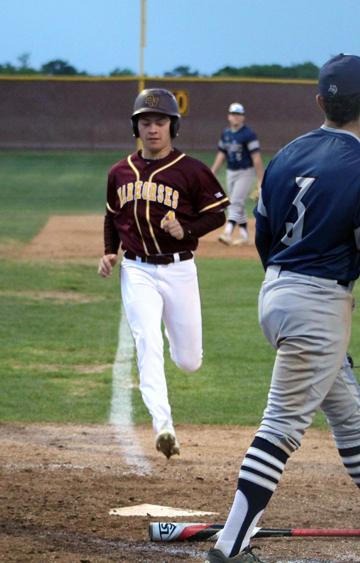 Hondo beat the Varsity Warhorses in a late inning rally on April 2nd. Devine led 1-0 until the top of the sixth inning when Hondo was able to lead 1-3. The pitchers for Devine only allowed five hits and the team had no reported errors. Devine’s scoring run came in the bottom of the fourth. Joseph Guajardo made it to first after a fly ball to right field. He then advanced to second on a passed ball and then third on a wild pitch. Dalton Kramer hit to the left fielder and Guajardo scored. Gehrig Runyan threw 35 strikes in 69 pitches. Dalton Kramer had 11 strikes in 27 pitches. Newt Crouch had 10 strikes in 17 pitches. Guajardo 1 run, 2 hits. Kramer 1 hit, 1 RBI. Newt Crouch 1 hit. Brady Harrell 1 hit.